You've spent hours upon hours coding in your apartment, in cafes, even while riding public transit. Now comes the nerve-wracking part: your first customers are about to take your product for a spin. You know that you need a customer service team, but you've never built one before. Where do you begin? At Zendesk, we've helped thousands of startups like Airbnb, Brandless, and Peloton build relationships with their earliest customers and scale their customer service as they grow. In this guide we'll show you how to build a world-class customer service from the ground up—that will build trust with your customers and give your products the chance it deserves. 03 Assigning metrics — Why? What's important? 04 How do you take action on customer feedback? For founders of startups, passion for the product comes naturally, but customer service? Not so much. So while it's easy to obsess over every product feature, startup founders need to prioritize building relationships with their customers from day one. That said, cultivating a relationship with your customers can be incredibly difficult. It takes diligence, patience, and processes that can be difficult for founders—and at the heart of it all is being committed to listening to customers. "Your product doesn't yell at you. Your product is like a dog, mostly obedient and never complaining. Your customers are like your boyfriend or your girlfriend, though. They have expectations and feedback because you're in a real relationship that may not always be so easy to master," says Mikkel Svane, Zendesk CEO. "You have to be vulnerable with your customers." So why is being vulnerable with your customers vital to your startup's future? Simply because those conversations—as awkward and painful as some of them will be—generate invaluable feedback that will help you build a product that truly serves your customers' needs. In the beginning, you will have the least amount of resources and processes in place—so it's all hands on deck. As the face of the company, the founder must be available to those early customers on a personal level. Give customers your email address, and respond in a timely fashion. Model this behavior in front of your team, however small or large. Learn what makes customers happy and what makes them angry. Listen on your social media channels and investigate every complaint. Those g.gifts, and they're how your customers will teach you. Dig into the details to find meaningful insights, and don't ignore them because they tell a story you don't want to hear or because they're hard. Pay attention for precisely those reasons. Amplify the voice of your users. Don't stop with just talking to customers—make their voice the loudest thing in the room. For example, you could use software like Geckoboard or Klipfolio to create internal dashboards that display real-time customer feedback (as well as other important business metrics). Consider building a dedicated channel in Slack that broadcasts customer issues to all employees—it's a great way to get product managers, engineers, and other employees directly involved in the support process. Base product iterations on customer feedback. When developing your product roadmap (and later, when you're hashing out the product requirements) be sure to incorporate user feedback. Analyze how they're using your product, and embrace agile development so you can shift direction quickly without losing large amounts of development time. From its crowdfunding campaign to becoming a $1 billion company, Peloton focused on creating a customer-obsessed culture, and one hallmark of that effort is its use of Trello and Zendesk to turn customer feedback into actionable insights. From customer support tickets to feedback generated during its "Feature Fridays" on Facebook (when the company encourages users to post new feature ideas), Peloton automatically funnels suggestions and complaints to its Trello board. That allows the company to get an accurate view of what customers want and generate actionable reports that product managers and designers can take into planning meetings. For example, recently the Trello-Zendesk integration brought to light the need to provide an adult-language filter for riders who wanted more family-friendly workouts. That insight gave Peloton the opportunity to innovate, drive engagement with its users, and reach out to a broader audience. "Startups need to think about support as a core company concept early on…One mistake that I've seen too often is that startups start thinking of support as an afterthought. One of your first hires should be on the support team." Follow-up with users who give you a negative rating. This is a great way to build trust with customers and retain their business. Analyze bad ratings that include comments. While it might be tempting to spend time on the glowing reviews, you'll garner more actionable information from those customers who are unhappy with your product or service. Meet every week to discuss customer satisfaction outcomes. Set time aside for the team to analyze negative comments and brainstorm about ways to remedy the underlying causes. Group negative comments by cause—and look for trends. Doing this will help you identify problem areas such as long ticket resolution times, poor product documentation, or bugs/unexpected product behavior. Now that your startup has begun to build relationships with customers, you'll need a tool that will provide a unified view of your support process. Sharing an email inbox might seem like an acceptable option at first, but you'll soon run into serious logistical problems, and you'll have virtually no ability to track metrics. Perhaps the most important factor in using help-desk software is that it enables you to connect all of your channels into a single view. What's a channel? It's how your customers will contact you—email, phone, social media, chat, and so on. No matter which channel your customers choose, you'll want those interactions to appear in the same place (this becomes even more important when interactions start on one channel then move to another, such as email to phone). Your first steps will be to connect your contact@ and support@ email addresses, as well as your social media channels. For example, when startup LimeBike launched its electric bike and scooter service in June 2017, the company knew from the beginning that it would need to unify its channels into a single view so the business could meet the expected demand. "When you're scaling rapidly, it's important that all your communication channels are connected," says Lakeysha Hayes, domestic and international customer service manager at LimeBike. "We wanted to have email and phone in one place, see stats and get feedback from customers, and to be able to share that out to the team and to each city we serve." At this point, you should consider whether you have the resources to have live support. If you do, you'll need to have set clear operational hours and set up a workflow to ensure there are no gaps in coverage. If you're unsure, it may be a good idea to at least start with setting up a phone number. This is simple—you can set one up in minutes, have it direct to voicemail, which automatically creates a ticket, and then put that on your homepage or on the order page. Whenever a query comes in you can then call that customer back and lock in that sale. It adds legitimacy to your presence, and it's also a great way to test the demand of a live channel before fully launching it or finding the resources to fully staff it. Plus, most customers don't like using the phone unless they have to, so it's an easy way to adopt the professional presence of an established company without all the typical associated cost. You should be on the lookout for common questions customers ask about your product from day one and building consistent answers that you can quickly send to customers (macros can be a handy way agents can save time, and you can also use automations and triggers for better efficiency—more on these later in the guide). At the very least, you'll need a workflow in place to better organize and continually update the product FAQ, which will be your customers' gateway to self-service. Self-service plays an important role in ticket deflection, a key factor in reducing the number of support tickets your startup's customer-service team (which at this point, will still include everyone in the company) receives. Your helpdesk software should allow you to turn user feedback in helpful articles that will not only serve your customers but help preserve institutional knowledge about how your product works. Be sure to create a clear workflow for article creation that includes fact-checking and regular updates (for example, after new product releases or bug fixes). Take advantage of tools that make the knowledge management process easier, such as placing a web widget on your site. By embedding a web widget (which can be customized to reflect your startup's branding), you'll provide customers with clear, simple ways to reach you via contact forms and live chat—and it will also offer targeted self-service content that could help resolve issues before an agent needs to get involved. Hopefully you've had multiple chances to review and improve your workflow, but now it's time to focus on getting insights from your customer service team to the rest of the company. 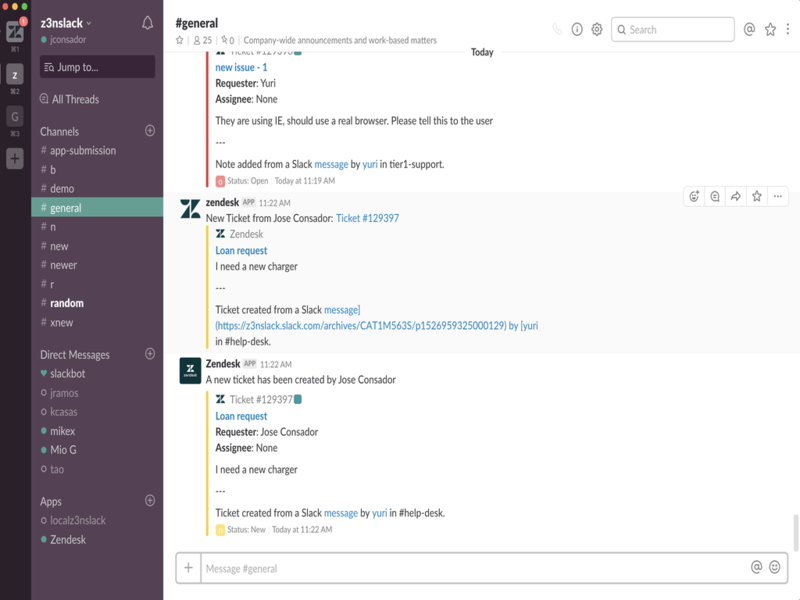 A great place to start is Slack integration, which will provide visibility into support tickets and improve communication between your support and product teams. Meanwhile, customer service should be passing customer feedback to the product team with tools like Trello, a handy option for organizing tasks and improving productivity. When you need to escalate development issues to product engineers (which will happen), you can integrate Jira and Github so agents can link tickets directly to issues and projects. And don't forget your growing sales team. There is a variety of salesforce automation tools available, like Zendesk Sell. Zendesk Sell is our software that helps enhance productivity, processes, and pipeline visibility for sales teams, and of course offers the best integration with Zendesk Support. Start your Sell trial here. If your startup uses an e-commerce platform—like New Zealand-based shoemaker Allbirds does with Shopify—it's a good idea to integrate it with support. "Really, the best feedback that we get is around the product, "says Ashley Fattig, Allbirds customer service manager. "We've made tons of changes and improvements to the shoe in the last year, and almost all of that feedback has come through Zendesk." While the marketing team sends out quarterly surveys, Fattig collects product-related feedback from tickets and shares it with the product team on a regular basis. So far so good—your self-service options keep improving, and your teams have all been connected in a common environment. But you're not done yet. Customer data will be spread across platforms and teams, from marketing to accounting, which calls for creating a single view of your customer—for example, your customer service team will need to know whether the customer's account payment is up to date, and your sales team absolutely must be able to see if the client they're trying to upsell has recently contacted the company about product outages. You'll also want to connect Mixpanel or other customer analytics tools so your teams can gain a deeper understanding of the customer journey. Have they searched your self-service content before contacting you, and how much time did they spend on those pages? Did they recently upgrade to a newer version of the product after being an inactive user? You'll want to know the answers to these questions. Beyond customer data, you'll want to gain insights into how customers use the product—advanced analytics tools like Amplitude and Segment can collect data that will help you refine your product and improve user retention. Finally, consider using software such as Nicereply and Delighted, which will help you capture more feedback and make the support process even easier for your most valuable asset: your customers. You've set up a support tool that enables a unified view of your startup's customer service function—and in doing so, taken the first steps toward offering robust self-service content. Now it's time to dive into metrics. Just like athletes who measure performance indicators as part of their training process, your startup must understand what it does well, and most importantly, what needs improvement. Although your customer service tool should provide the flexibility to craft metrics specific to your business, there are common measurements that almost all businesses need to track. Below you'll find explanations of these common metrics, organized into two categories: internal operations, which provide information about how your team is performing, and customer insights, measurements that enable a better understanding of what makes your customers tick. Pay close attention to this metric—a spike in tickets could be an indicator that something's wrong or be a positive sign that your recent investment in a new customer service channel (or marketing campaign) is working. A related metric, ticket distribution, will help you track these sudden influxes of tickets. Find the patterns and investigate. Although knowing how many tickets your organization receives helps plan staffing, monitoring tickets by channel provides valuable insights into how your customers prefer to communicate with your company, whether that's via email, phone, chat, or self service. That knowledge will play an important role in shaping hiring pace and training. Over time, you can also intentionally drive traffic to your preferred channel (for example, by adding a link to your ticket forms when it comes in via email or responding to phone calls with your email address for future issues). This metric should match up with new ticket volume. If it doesn't, your team will soon have a growing backlog and struggle to keep its head above water. However, startups tame a growing backlog by turning to automation and self-service options. Meanwhile, a related metric, predicted backlog, can help you plan for heavy service times based on past results. Your customers will notice. When a customer submits a ticket, he or she expects a timely acknowledgment of the issue. Keep an eye on this metric as well as how long a customer has been waiting for a resolution. First reply time measures the time between when a ticket is first created and when an agent responds. Depending on the channel, acceptable times can range from less than a day for email, a couple of hours for social media, minutes for phone, and mere seconds for chat or messaging. You'll want to test your response times across different channels so you find the right balance between business needs and customer satisfaction. How long does it take from when a ticket is first created to being closed? That question can point toward whether your agents need more training or tools like macros (more on that later) to work more efficiently. You might discover that long resolution times could be a sign of persistent complex issues that merit a permanent fix in a future product release. Customers increasingly prefer to answer questions on their own, so it's a good idea to track how your help center serves this need. Check common website metrics such as unique visitors, page views, and visits to gauge how many customers are using the help center, and then measure ticket deflection by dividing the total number of unique visitors to a particular piece of content by those who opened tickets on the same topic. You'll also want to keep an eye on bounce rate, which measures when unique visitors leave your knowledge center after viewing the first page they landed on. That might point toward customers switching channels or seeking answers elsewhere. And be sure to track tickets created from comments in knowledge center articles—if you're seeing a lot of these tickets, then your content likely needs work. As your startup begins to expand its business and bring on more customers, you'll need to start tracking adherence to a baseline of customer service. Service level agreements, or SLAs, spell out your customers' expectations for a certain level of service and failing to meet these demands could threaten contract renewals and your company's ability to attract new business. You'll want to set up triggers and workflows in your customer service software that will escalate tickets that are in danger of violating the SLA. Other helpful metrics to measure include replies to resolution, one-touch resolution, tickets per transaction, and tickets to repeat transactions (to name just a few. . .of many). However, while focusing on these metrics will point you in the right direction, context is everything—you'll want to know how those scores measure up compared with competitors. Chances are you've answered a simple survey that asked you to rate a company's customer service. So when you see a company state that its CSAT rating is 90 percent, that means 9 out of 10 respondents gave the company a passing grade. Note that CSAT surveys can be customized in appearance, wording, and cadence—so be ready to experiment. CSAT can be driven by a variety of factors that have influenced a customer's satisfaction. Whether she has in mind her experience with the product or the help she received from someone on your team, it is important to monitor this because decreased satisfaction over time will lead to customer churn. A good practice is to send a CSAT survey immediately after a support interaction has closed. You've most likely taken this simple survey before—it asks customers to rate on a scale of 1 to 10 how likely they are to recommend a product or service to a friend. This can be an incredibly valuable data point, since positive word-of-mouth can be an important means of growing your business (and the converse can be catastrophic). When sending out surveys to your customers, be sure to set a regular cadence (say, once every six months) so the data isn't skewed, and don't swamp them with too many emails—survey fatigue will set in, undermining the point of the exercise. (Ensure this doesn't happen by sending NPS surveys to a select group of customers—not your entire customer base—and then staggering the blasts by quarter.) With NPS, you're gauging brand loyalty rather than the success of a particular interaction. And if you're going to ask for feedback, take action on the results before sending out another survey. Be on the lookout for low NPS ratings—by creating engagement incentives like access to beta tests, opportunities to meet with product managers, and swag (of course) for these at-risk customers, you might be able to reshape how those users view your startup's product and service. Churn surveys elicit feedback from customers canceling or downgrading service with your company, providing an excellent opportunity to discover areas that could stand improvement to prevent more churn. A carefully constructed churn survey can help you identify major factors in your churn rate (for example, customers experienced bugs, wanted more personalized support, or are just no longer using the product) and decide where you need to focus as your business moves ahead. Your startup can now track and analyze customer service metrics. It's time to move one step further by gathering feedback from your customers. But how do you find patterns in all that noise—and better yet, discover clear, actionable insights? "We have a lot more data that we can use to have better conversations with our product managers,"
The first step is to combine a description box with structured custom fields on your ticket form, giving your customers an easy way to self-tag their feedback (by product, for example). Ask your team members responding to tickets to brainstorm about helpful fields, since they will naturally recognize some patterns on their own. However, because customer issues change, be sure to keep those frontline employees involved. Fortunately, setting up custom fields is a snap, and their flexibility means they can be organized to gather specific information. Are your customers struggling with a clunky user interface, latency, or billing issues? Custom fields will help you sort feedback into easy-to-navigate buckets, and in turn, enable you to direct tickets to the right people based on their expertise or experience. That also opens the door to sending customers to your knowledge center, deflecting the ticket altogether. For example, you could set up a "password reset" selection in a drop-down menu that, once selected, automatically generates instructions that the customers can use to resolve the issue on their own—thus negating the need for a ticket at all. As customer feedback comes into sharper focus, you'll need to develop processes for sharing the data company-wide. In the early days of startup mode, this might not be a huge problem, but as your business grows you're likely to encounter the dreaded silos. Silos can be stubborn things, but your customer service software should enable you to bring transparency across departments through shared access to tickets and reports. One tactic to break down silos entails holding daily stand-up meetings in which customer feedback can be discussed among various team members so responses can be prioritized. For example, Bikeshare startup LimeBike initially relied on a spreadsheet to track customer feedback, but as the company's business took off, it invested in a customer service solution that would make it easier to share information across teams. "We wanted to have email and phone in one place, see stats, and get feedback from customers, and to be able to share that out to the team and to each city we serve," says Lakeysha Hayes, domestic and international customer service manager at LimeBike. However, while it's important to have a tool in place that can help you share feedback across teams, no software in the world can replace human interaction. Consider appointing a liaison between your support and product (or finance, sales, etc.) teams to improve the flow of information. And there is a clear benefit to having software engineers and product managers shadow your agents on customer support tickets—or like some startups do, assign tickets to new hires so they understand common product issues. While it might be tempting to look at this exercise as taking away from valuable coding time, it will help product teams develop better use cases and roadmaps that reflect what your customers need. How many times have you seen a company put great effort into generating a report with real actionable insights, only to see that information discarded or ignored? Don't make that mistake! Whether it's scheduling more training time for agents or having developers fix frustrating bugs that make your customers want to tear their hair out, your startup will earn loyalty by resolving the issues that matter to the people who use your product. Ensuring that happens requires accountability—as the leader of your startup, make sure that this process becomes an integral part of your company culture. Set up a process for following up on customer feedback, and tie that to employee performance. Your customers will thank you. Those customers should also be a target of your customer engagement plans (long-term conversations with customers and relationship-building). This extends far beyond solving immediate problems—it's about creating and nurturing an emotional connection with your customers so that they'll stick with your product through good and bad. While this encompasses the totality of the customer experience, pay special attention to getting employee buy-in. One way to drive customer engagement is to tag tickets for good customer service ratings, watch for trends, and then create an engagement strategy that pulls engaged users—"advocates"—into research groups, beta tests, and so on. These advocates can serve as your product's greatest ambassadors, providing priceless word-of-mouth buzz that will attract new customers. Take Wrike, which provides cloud-based project management software, for example. It uses its online community to connect users with product managers, which drives customer engagement and loyalty while helping the company prioritize its product roadmap. Customers can now navigate to specific threads about automation or reporting and then provide feedback to the company. "We have a lot more data that we can use to have better conversations with our product managers," says Stephanie Westbrook, documentation and community manager for Wrike. So far so good—you're actively gathering customer feedback, sharing it across teams, and taking action based on what users have told you. Well done! But you're not quite finished. Now it's time to close the loop with those customers—tell them what you did, what you're going to do, or what didn't make the cut. If your customers have taken the time to tell you about their experiences with your product, they'll want to hear from you. A great way to do this is to create an online community where your product managers can share new product features and explain why certain requests have been tabled or postponed for future releases. This can be an additional source of feedback and give customers a chance to weigh in on what your startup is working on—and it can take a bit of heat off your support team. In the case of Wrike, the online community proved to be a great place to do this. "People noticed that we were implementing stuff that they were asking for," Westbrook said. "Even on other threads they would say, 'I saw that you guys did this, that's so awesome.'" Think about what makes a customer service team—or any team, really—work. It comes down to three essential elements: people, process, and technology. If you make thoughtful choices in each of these areas, you will build a flexible and resilient organization that will earn customer loyalty. First things first: don't skimp on staffing. Be prepared to put real resources into your team, and that means paying salaries that will attract strong candidates and minimize turnover. Your ideal hire will be empathetic, possess solid technical and communication skills, and show an eagerness to learn and grow. The best candidates will be utility players with a wide range of skills and enthusiasm for turning support interactions into opportunities to build customer loyalty (and even sell new products). Be sure to give these new hires paths to promotion and opportunities for self-improvement. For team leaders, managers, and directors, you'll need people who have strong interpersonal skills and solid project management knowledge. They should be able to manage a large group of employees and while having a deep understanding not only of the product but the company's long-range goals. The latter part is critical, because the highest performing support teams collaborate closely with product, sales, marketing, and other parts of the organization. Choose the kind of managers who realize that mentoring junior employees will create the company's next wave of leaders. You'll also want to think about appointing a lead administrator who will focus on improving workflows via macros, triggers, and automations, as well as troubleshooting technical issues quickly so your agents can stay focused on helping customers. As you settle on how you'll organize your support team, don't forget to clearly define roles, the reporting structure (team leads, managers, and directors), and performance expectations. Investments in your people and process will grind to a halt if you don't have the right tools to make serving your customers easy and effective. For a deep dive on those tools, see Chapter 2 of this guide. In addition to your core help desk software, consider enlisting a bit of non-human help. A tool like Zendesk's Answer Bot can be a great way to direct customers to self-service articles in your knowledge center, and thanks to machine learning, that bot will only get better with time. It recognizes common issues within support tickets—for example, questions about return policies or password resets—and recommends relevant Guide articles to help the customer help themselves. That saves your agents valuable time, enabling them to focus on more complex issues and build customer relationships. And in the event that the bot can't resolve a customer's issue, it will automatically route them to a human agent. By now you should have a solid understanding of every step of providing excellent customer service, from getting user feedback to forming a dedicated customer service team. The thread that runs through all of these efforts? Your customers. Keeping them at the forefront of every decision you make will set you—and your great product idea—up for success. For more great tips about metrics, software solutions, and customer service best practices, be sure to check out Zendesk's Resources. And, if you're a founder wanting to get started with Zendesk, join our startups program to get a year of our products for free while you get your startup off the ground.